could i use 3 volts to test the bare diode? Hello. 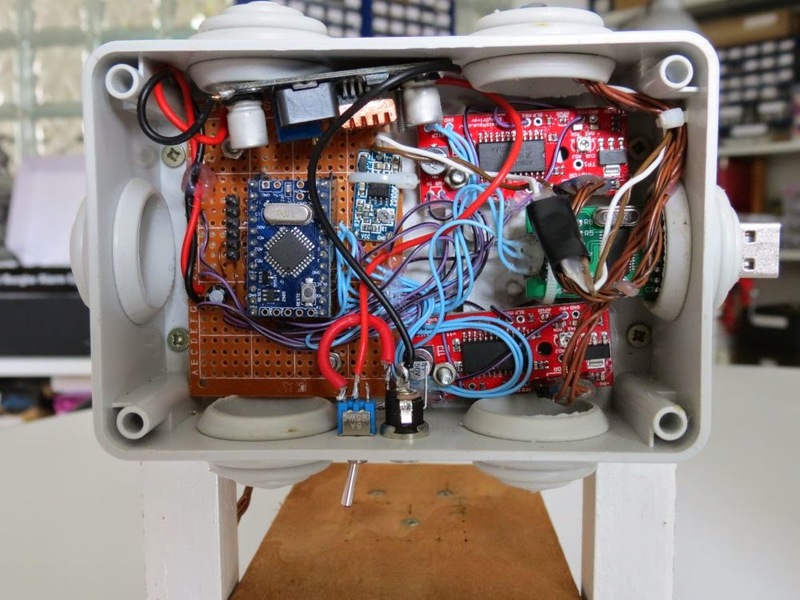 3V could do the job, but not more or you could damage the diode. Also limit the current output or you will burn it. What are you using as your diode driver? The blogger comments are acting up. Hello, i use a cheap ebay LM358 based adjustable driver 100mA to 400mA, loaded at 5V. But i've also try a simple LM317 driver without problems. Awesome project. Love the ideas reusing old obsolete hardware. Do you have an example of the LM358 board you used? ebay have a few different options listed. Unfortunately i've no schematics for the LM358 driver. In the picture above, the one of the board, you can see it next to the Arduino core. Fan installed, look at the new picture above. Thank you. How the mechanism is set to the initial position of the axes? Manually? Hello, if the grbl homing cycle is enabled ($17=1) the home position is reached every time the engraving begins. 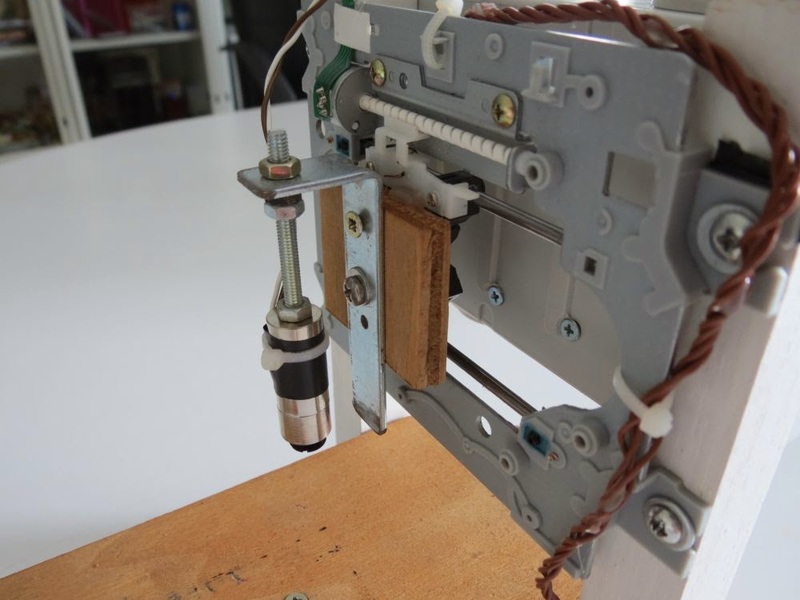 End-point are missing, cause the my cd-rom assembly are end-safe, i mean, the moving mechanism has a spring that prevents the locking of the motor, event if it reach the end of the slide and continue turning. On a bigger version, or if the motor can break, i should mount end-point sensors, which are supported by grbl. I do not understand how the controller finds home position without sensors or switches. When the device turned on, its carriage may be in a unknown random position. Or grbl save last position in flash? It moves for 38mm every motor, even if the already are at home. It is for this reason important that the motor are end-safe, i.e. they should not break even if the moving attached the the motor is locked because is already at the end of the slide. Nice. Are you sure you are using the laser from a CD-rom writer? They are usually IR-based. DVD-lasers are usually red. Thank you for submission. It was a typo error, I've edited the post now, i had write CD-rom writer, but the diode comes from a DVD-rom writer, a led one diode. Hello, bottom or top part? I've bought exactly the same laser driver as you used but I dont know how to connect it. Could you explain what is connected to what? I've got Laser diode -ve and +ve and TTL Control +ve power +ve and power & TTL -ve. What connect to what in the schematics? I've connected it as on the picture but is it normal that without connecting TTL I have 3,4V on LD+-? When connecting it nothing changes there is alvays voltage on laser output. I'm sorry but at present, I can not check the levels on my driver. Anyway, to me the laser output shoud not have that voltage when TTL is low. That days i'm full of works and can not test levels on mine, but you could also try a simple LM317 laser driver, i've tryed it and works pretty weel. Remember eyes protection on any test. I've finally made it work. Is there any good method of setting lasers focus that you would recommend? I just focus pointing to some material, like wood, and trying to get the smallest dot possible. Looking at the dot with safety glasses. It's from the GRBL project. 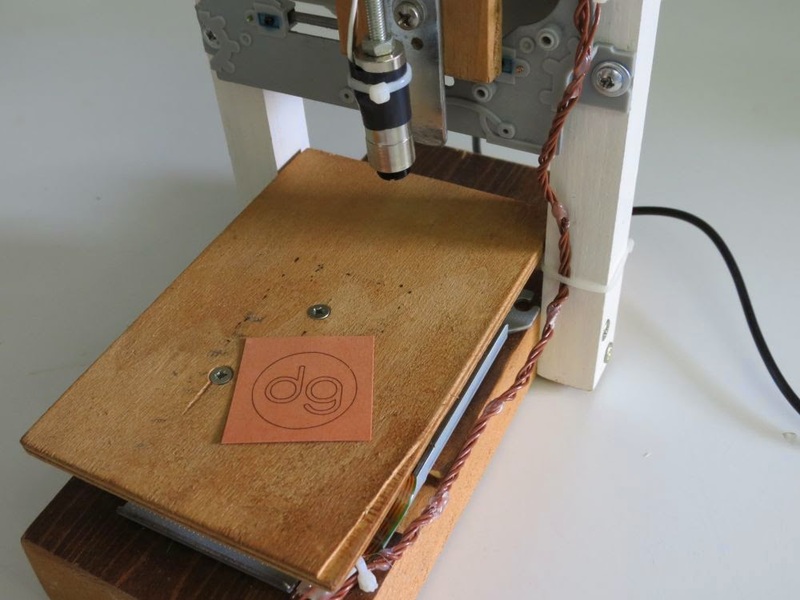 I've built a laser engraver and I'm using the inkscape with the laser engraver extension. I sent it to the arduino with the UNIVERSAL G-CODE SENDER. It works, but my problem is that the design is drawn by the laser doing a zig-zag, not keeping the track as the yours do. Have you any idea for this behaibour? Strange behaivior. May be EMF interference, but it has to be tested. 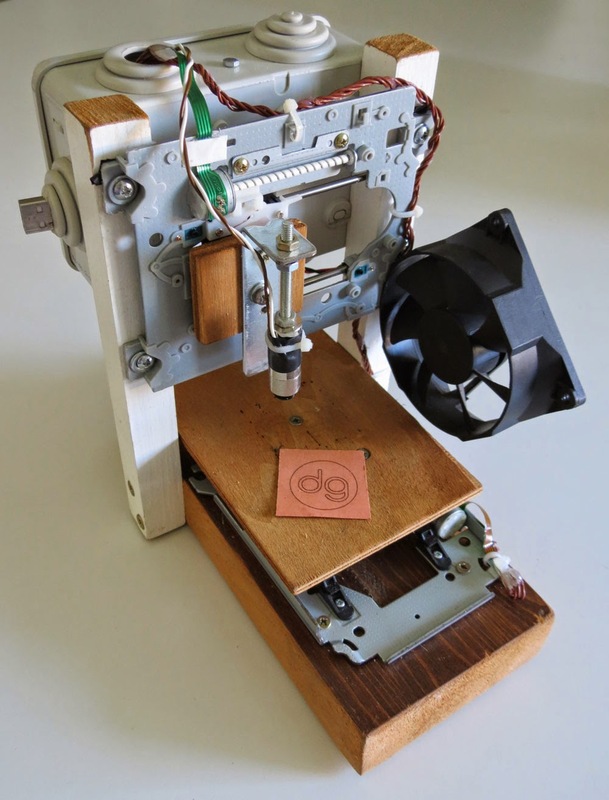 At first, try to move just one motor at time (Machine Control tab on Universa Gcode Sender, not to send a g-code. Check that the motors move the right way, and there are not interfecences between the motor movements. I think this is not the trouble. Maybe I've not explained well. After upload grbl 0.9i to arduino board I try to move axis by axis control tab ( GRBL controller 3.6.1) but it's not work, GRBL just display "error : alarm lock"
I type $X to unlock and move axis again, its just say "error : Undenifined feed rate"
I don't know what wrong with my project ? arduino board/UART board/firmware or GRBL controller software ? Can you help me fxi that problem ? Thanks so much ! Use the grbl unlock command. If you are using GRBL controller it's in the advacned tab, or you can even write it to the terminal input. On another engraveer, I've enconter this issue too using grbl controller on 0.9. You have write the feed rate command by hand. Or, you can use Universal G-Code Sender to resolve this issue. Sir i want to build one and only the laser diode and driver is left.I bought lm358 ic.Can you send me the circuit of laser driver please. Hello, the laser driver circuit used in this circuit was buy on ebay, and I do not have the schematic for that. I've build and check another driver, based on the LM317. You can find the circuit for a LM317 driver searching in google. Hello, many files are in the link you provided. What exactly should I upload to your AVR? I cordially greet Jacek. Select the version, here i'm using the 0.8c, but the 0.9 also will work. Now I understand what you are recording a program for avr hex? Do you have to specifically set fusebits Aeacus? I do no understand what you mean for "recording a program for".. If you mean, what am i using for upload the Hex to AVR, Then take a look to Extreme Burner AVR, which also can set the fuse for your ATmega328p. If you are using an Arduino board, then the fuse should already be set to the correct values, i.e. set for an external 16Mhz crystal. If it's not so, you have to set fuse to run your ATmega328 at 16Mhz using an ext. crystal. Thanks for the help. Regards from Polish. Hi. I think I have a problem in determining the size of the work area Grbl Controller 3.6.1. The program Inkscape workspace is 48x48mm after generating the * .ngc and imported to go Grbl Controller coordinates 330x330mm I even do not know why? Sorry for my english;) I hope you understand what I mean. Probably too quickly snatched questions:-) Now I have a problem with setting the machine coordinates because it is too large in terms of 600x600mm course Grbl Controller. In GRBL controller, you should also have the view tab, look here to see if your design is good. If you are using GRBL 0.9 also set the "x/y max travel". Already working as it should. Do you have a diagram of the laser driver? Not for this one, this LM358 was buy on ebay. I've built other LM317 using the common schematic you can find in google. They work well. Hello, i use a 12V 1A adaptor. The DC DC step down converter converts it to 5V, it's a cheap LM2596 converter, which is used for ATmega board, the laser driver and the motors. The USB it is used only as a TTL adaptor, not for supply purpose. Awesome project, can you share please the ebay link where you bought your lm358 driver, thank you. Hi. What about the laser itself. What kind of optics did you use? Hello. I've used a standard TO-18 laser diode metal housing, it's almost 12mm x 30mm. ineed to know about the power supply that is not mentioned in the crt! Hello, you can take a look at my reply to "chris" September 29, 2015 blog post comment. i nee to know the power circuit...that is missing in the circuit schematic! Hello, it's very nice project, congratulation. I have a question about PB6 and PB7 connection pins, I have bought arduino nano V3.0 (http://img05.deviantart.net/7fdd/i/2014/215/2/a/nanopdf_by_pighixxx-d7thgif.png) and there's no PB6 and PB7 connection, is there any way to connect it? or any other alternative way? Hello. The enable pin (the 12, PB4) is the pin to connecto to switch on or off your laser driver. You have to set lines x and y step/mm according to your motor. Ususally cd-rom motor are 53.333 step/mm. You can find instruction on how to set those values on the grbl wiki page. I had to set mine at $0=93.333, $1=93.333. for the DVDrom trays i used. You can use both 0.8 or 0.9. But on both version you have to setup the grbl. Check it out here: https://github.com/grbl/grbl/wiki You will find all about setting up a grbl. Basically what i do for this one here it's posted above in description. Hello, first: do NOT capitalize your message. Then, at first try to make motors move on a breadboard? Also connect an amperometer to take a look at current absorbtion. I got unlocked message from GBRL controller. My machine is now turned on all the things very well on software side ...but I have problems in hardware it seems to when the begin button is selected the both motor shaft is vibrating and the sledge is not moving but the controller is working good ... I powered the Ardunio using dc adapter 5volt 2amps I take the motor supply from Ardunio 5volt pins and GND pin not directly from adaptor... I think the voltage or current is not sufficient for motor or any parameters error in GRBL. Any suggestions sir... Please reply. Hello, thank you for de-capitalizing the message. Have you check how much current the motors draw by using an amperometer? Just wondered how you get the laser to turn off when it has to move from one point to another, and then back on again. My laser is connected to pin 12 of the Arduino and that just switches it on. I get burnt lines when it moves. Hello, it's the "spindle" on/off command. The G-Code command M3 (enable spindle) and M5 (turn off spindle). This is the link for the Hex file. Well done! And thank you for sharing your solution here. Nice tutorial I read, Thanks for sharring Davide :) ask - can I use CNC shield instead EasyDriver Alegro ???? Yes, it should do the job. your schematic only shows the arduino mini and drivers , hat about the d driver electronics ? Hello, I use EasyDriver stepper driver for this project. 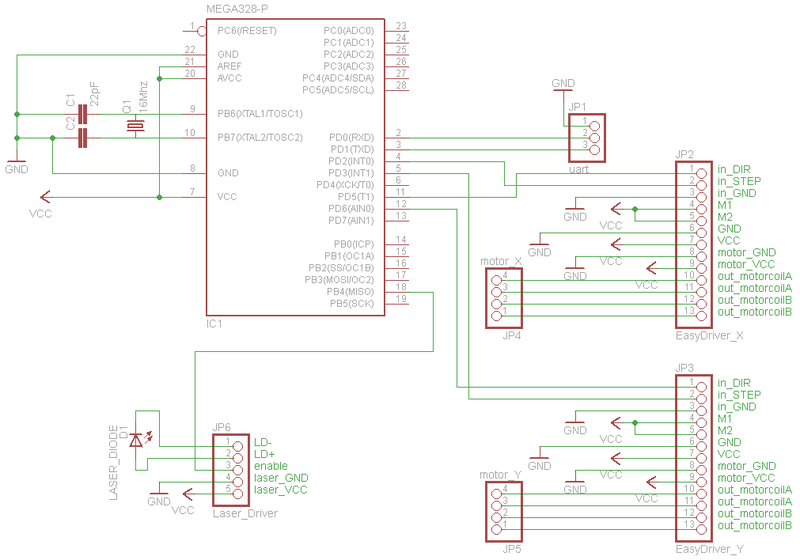 The EasyDriver schematics can be found online, or any other A3967 compatible board should works. I am wondering if your laser engraver may be used also for sponge cutting. Hello, I doubt 150mW it's a little too low for sponge cutting, but you may try this just by building up the laser and laser driver. (Note: protect your eyes when you use a laser > 5mW). Hello, no, you have to build it by your own. This is blog is sooo awesome! I went shopping today for components and Nano3 was delivered to the door. I have stripped a DVD burner for diodes and a CD writer for the carriage. I will scrounge for a Diode mount to focus it properly. I have also downloaded Inkscape with the engraver extn, and checked that it works. I intend to use the LM317 laser driver with 100R VAR pot to feed the lazer. I have absolutely NO FKN IDEA how to connect everything but I cannot wait to try. what kind of laser safe glasses do I need for a red DVD laser? there are so many specs and I don't know what the wavelength of my laser is. Got Nano3 working on the first GO! Plugged into USB, Win10 sorted drivers out(I assume)and power LED came on. Got message in bottom left corner to say how many bytes uploaded. Launched the Arduino 1.6.13 desktop app. Opened the Blink sketch and uploaded it. After about 15 seconds of compiling, the PIN 13 led started blinking. Struggled a bit with Terminal app to run GRBL 9 because I did not realize that the Arduino app actually contains it's own terminal window. Now going to navigate the settings. Set comm port to COM6 and baud rate to 115200, and sent the '$' command and instantly received the help menu. Opened [Settings/ Firmware Settings/ GRBL] and received the list of settings in a table who's values can be edited by dbl clicking. Write my name in InkScape 0.91 and exported gcode file using the GCode extension. Opened the file in Universal GCode Sender and sent to Arduino Nano3. Executed lines of code perfectly. Now to hook up the EasyDriver 4.4 with a 4-wire bipolar stepper motor. This is SOOO awesome... I cannot believe how easy this is! @elektrolyte. Just been following your comments. Well done. It is quite rewarding when you take all the time and effort and it actually pays off. I've made 2 now myself but now want to build a bigger cnc machine, just need the money. :) Would like to see yours when you have it just as you want it. If Davide does not mind I can post the links to them for you to look at. Hello Stuart, yes of course you can post the link here. Hi Davide. Thanks very much. The first one was just to see if I could do it, the second one is a bit smaller and neater/tidier. They both run on a 16 volt 4 amp laptop power adapter/charger. I used Arduino UNO's for both with GRBL 0_9j. Hello, you've done really a good job! Just a tip and a question. The tip: a fan will prevent your laser lens to get dirt. The question: what's laser's driver circuit you are using? I was going to use a fan but did not have one the correct size at the time. The Laser driver is the one most people seem to use, made with an LM317 Regulator. I have it on Instructables web site if you want to have a look. I'll just warn you though, it does not look pretty from the back. If you move the mouse over the boxes on the image of the back it will tell you what everything does. how much does it cost to you ? Hello, it's made almost on recycled parts, so I suppose something between 10 and 20Euro. Hello, sorry i do not understand. How the laser did what? Did you any tutorial for how to put the laser of the dvd and how to make his driver. Hello, About the laser, there are a lot of youtube video that explans how to extract the diode from a DVD-ROM. 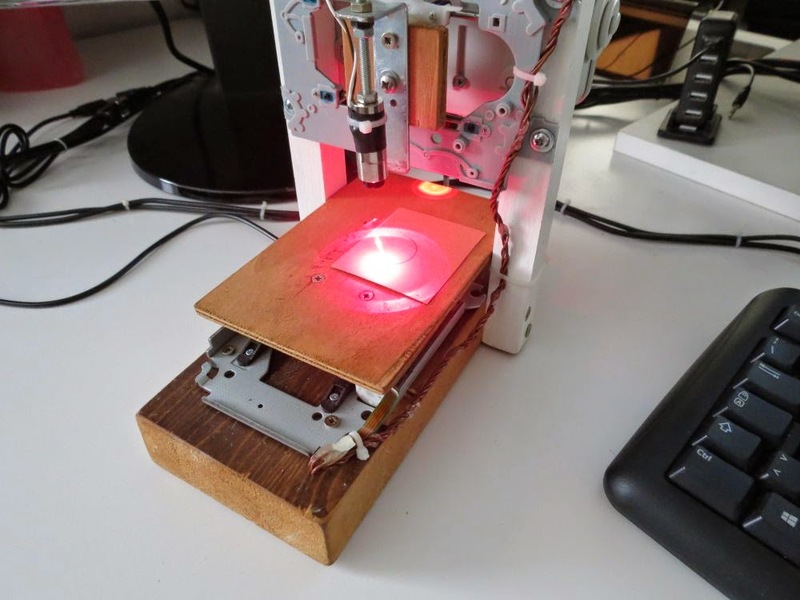 About the driver, I've publish my LM317 laser driver circuit here: http://davidegironi.blogspot.it/2015/12/a-diy-a4-laser-engraver-made-from.html but you can also find many video or tutorial on that argument. Hello, did you try to send just a g-code command to move the motor, without using the engraving software i mean? Also you could try mounting the same firmware I have here, if your pinout is the same. It also could be a motor driver issue. Hello mr. Davide I've done the same laser driver like many tutorials on YouTube but none of them work,,,, what should I do to make it burn? Hello, it may be your laser driver diode that is burn, also check two times before wiring all the things and take a look to the current absorbtion. Do you use CD ROM uses lasers, or it is only called lasers ? like laser tag games equipment that uses IR optics , but is called "Laser" tag.